Didn't think I remembered, did ya? Remembered how to quilt, that is. Well, at long last, I did. I did a bit of sewing between Christmas and the New Year, but I didn't actually finish anything. I started wading through the UFOs in my sewing room and pulled out some long-forgotten treasures. I pulled out a bag that I thought contained all the blocks. It did, but they were already sewn together!!!! And I put this away why? I quickly added some borders and did a simple quilting job. An entire month later, I finally finished the binding. This quilt is going in the gift pile. I don't know who will receive it yet, but I'm gonna enjoy looking at it a while longer. Ahhhhh, red. It's been a rather interesting week. First this. (scroll down to the wedding quilt. page 46 in real life). Check out page 80 of Quilter's Newsletter Magazine March 2008. You just might see another quilt that I quilted. Yes, that is my name beside the wedding quilt. The magazine hits the newsstands on January 22. I'm available for autographs. All joking aside, it was a cool experience working with the designers and going through the whole publishing process. I saw the magazine today and they did a great job. The photography is excellent and they wrote a really, really favorable article*. My daughter says it's more of a blurb, but I choose to call it an article. So there. Saturday's dinner was spicy fried tofu with sesame dipping sauce and vegetarian lo mein. Yum! Mr. Man deserved some cow after that meal. Last night's dinner was pot roast. It's never been a favorite of mine and I've never claimed to be an accomplished beef chef. This meal was quite bleh. Edible, but bleh. The fun part was the leftovers. All the potatoes, carrots, gravy and some meat went into the freezer for a future beef stew. A chunk'o'beef went into the freezer for future BBQ sandwiches. The rest of the beef went into the fridge for some beef stroganoff later in the week (we have some lonely mushrooms). Hopefully each of these meals will be less bleh than the original. Hopefully, I'll get to quilt during my "would have been cooking" time on the nights these easy-to-prepare meals are served. I managed to cook all these meals without further injuring myself. I am proud. I learned how to cook as a newlywed, but I'm learning some new skills. My son is grown, so I am learning to cook smaller amounts. My daughter is a vegetarian, so I'm learning vegetarian/vegan cooking. How, you may ask, does one make non-vegetarian grated cheese? It's quite simple, really. 1. 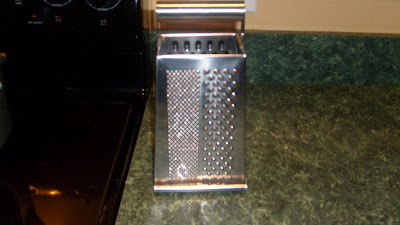 Get out your shiny new cheese grater that your mom gave you for Christmas. 3. Turn your hand slightly while grating and add a little meat to the cheese. 4. Whine a bit so you don't have to wash dishes with your injured hand. 5. 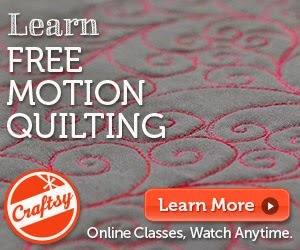 Go to your sewing room and quilt while watching CSI:NY in front of the fire while your husband washes the dishes. 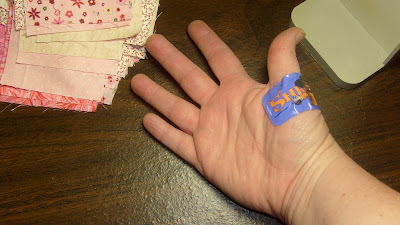 If you are short on quilting time or simply want to get out of doing dishes for a night, copy down this recipe, but make sure you have Shrek bandages. They make everything all better. My apologies for the poor quality photo. If anyone has a simple way to use a camera with only their left hand while photographing their right hand, please let me know. Oh, and anticipating a few sly emails coming my way, the vodka had nothing to do with the creation of the non-vegetarian cheese.